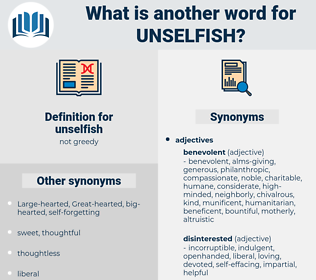 What is another word for unselfish? 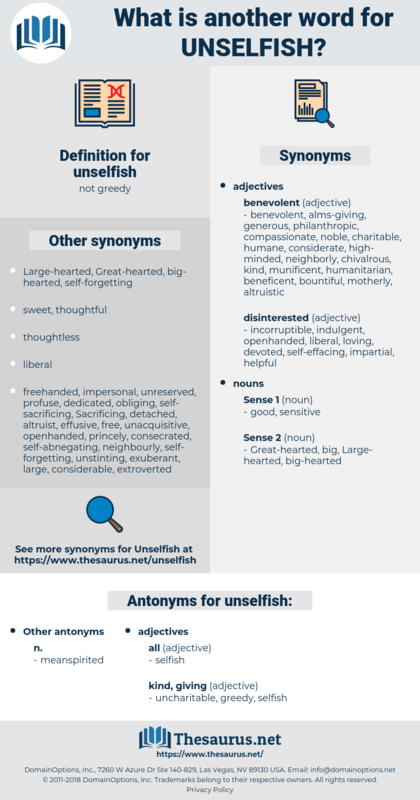 costive, mercenary, ungenerous, chary, narcissistic, petty, avaricious, thrifty, acquisitive, desirous, envious, illiberal, stinting, self-serving, avid, parsimonious, hoggish, close, miserly, begrudging, spare, frugal, small, tightfisted, cheap, mean, mingy, penurious, grudging, egotistical, self-loving, covetous, self-seeking, rapacious, egotistic, itchy, sparing, grasping, tight, resentful, closefisted, stingy, niggardly. Perhaps selfish people shouldn't have children; or perhaps it's the children that make us unselfish, and so keep us happy. And yet he does it every day of his life because he's ignorant, doesn't know any bigger, finer, more unselfish way of helping Hank.